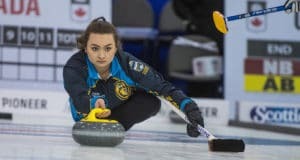 Heather Nedohin of Edmonton skipped her team of Beth Iskiw, Jessica Mair and Laine Peters to the Scotties Tournament of Hearts title Sunday afternoon at the Enmax Centre in Red Deer with a 7-6 championship-final victory over two-time champion Kelly Scott of Kelowna. The win was the first national championship for Nedohin as a skip. She played third for Cathy King in a 1998 triumph and finished runnerup to the title with the same team in 1999. 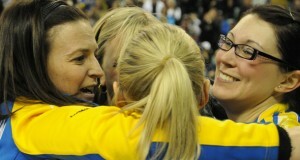 Alberta’s last national women’s curling victor, in fact, was that same 1998 team. 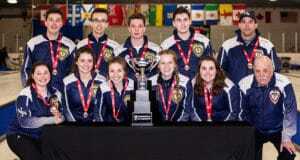 Nedohin’s team racked up five straight wins to complete its Scotties run and earlier sidelined four-time Canadian champion Jennifer Jones of Winnipeg to reach the final match. The 36-year-old Nedohin will skip Canada’s representative at the World women’s curling championship March 17-25 at Lethbridge’s Enmax Centre. 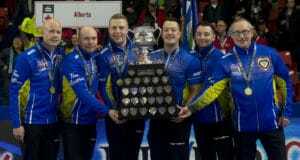 The win also guaranteed her entry to the 2012 Canada Cup at Moose Jaw in December and the 2013 Continental Cup at Penticton next January. In addition, Nedohin wins a total of $15,500 in prize money, $54,167 in cresting payments, $144,000 Sports Canada funding over two seasons and $40,000 Own The Podium funding for training and competition expenses. Nedohin also was named tournament MVP while the Shot-of-the-Week award went to B.C. vice-skip Sasha Carter who executed a long raise double-kill in the eighth end of the tournament’s Page One-Two playoff match against Jones on Friday night.